Way back, almost 3 months ago, I started working on a Drop Stitch Scarf for a friend. I’ve worked on it off and on, taking breaks in between to work on other projects (Christmas gifts, etc.) and it is getting closer and closer to being finished. I absolutely love this scarf, but I kind of hate knitting it. It is a very simple pattern, but I have to actually pay attention to what I’m doing and count stitches as I go along instead of mindlessly knitting while I watch TV as I usually do. 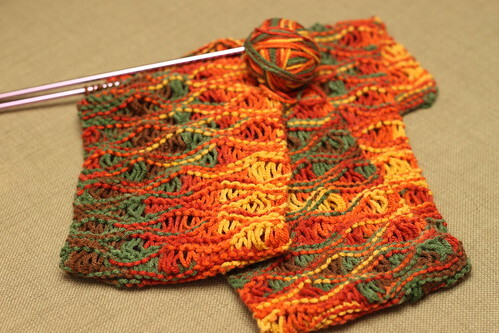 The pattern is fun, and beautiful, and I love the effect of the dropped stitches. It just seems to be taking me forever to finish. But, it is nearing the end. I’m so close to being done I can almost taste it. I may even finish it tonight while I watch my shows. I’ll be happy to have it done, but so sad to hand it over to my friend instead of wrapping it around my own neck. P.S. In the nearly 3 months(!) since I’ve posted here, I’ve been keeping very busy. While I have been knitting, my focus has been on cleaning/organizing my house, learning how to use my new camera, building a new web site for my church, and spending every free moment I can find with my kids and husband. As life settles back into our normal winter routine, I hope to be updating more often here! Beautiful. I love those colors. I’ve never tried a drop-stitch pattern. I’ll add that to my list of new stitches to try. Beautiful! I love the scarf and you’re doing a great job. Enjoy reading your exploits!